Are you looking for the best Pakistani Velvet Salwar Kameez? Searching for Wholesale Dealers of Velvet Salwar Suits Supplier all over the world? Finding the best & fine quality vendor in Pakistan? Then, luckily you are over the best online wholesale platform where you can find amazing quality and color variants of Velvet Salwar Suits & Kurtis. Being a manufacturer of party wears this year we have launched the velvet designer replicas and embroidered two-piece & Kurtis embroidered designs. Faisalabad Fabric Store the name where you can buy Ladies Velvet Designer Suits either in Casual wear or in Party Wear. Faisalabadfabricstore.com has propelled its designer velvet designs replica collection in this season. Having the latest designs of different brands like Khaadi, Sana Safinaz, Asim Jofa, Maria B, Ethnic, Tena Durrani and some more you can find a lot of designs and styles in single place. Velvet is the mixture of the Silk & Viscose quality fabric, have utilized in manufacturing these best ladies suits with dashing colors combinations. Every Replica velvet clothes have their own particular class with different dupatta combo like chiffon dupatta, Net dupatta, Embossed dupatta. These latest Velvet shirts designs are available in the form of stitch and unstitch velvet embroidered designer kurta in cheap rate with amazing styling plus the three-piece embroidered full suits including the Embroidered Net Dupatta with plain trouser & embroidered shirt within dashing hues combinations, apart from these our Two-piece collection of Velvet Pakistani dresses designs are very popular among our wholesale customer especially from USA & UK. 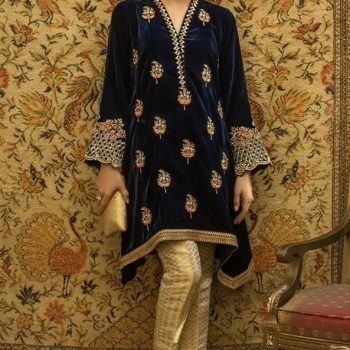 As I have mentioned that we are the best wholesale supplier of Pakistani designer velvet dresses designs in cheap price and with the stitch and unstitch embroidered suits you can get an amazing discount by ordering 20 suits. We are the best exporter of the velvet salwar suit to UK, USA, UAE, India and many other countries. Embroidered shirt (Full & half). Jamawar or Plain Velvet trouser. Net dupatta, chiffon embroidered dupatta. Three-piece, Two-piece & single Kurtas. Heavy embroidered patches (Daman + Sleeves). The inner lining of silk. Plastic bags with product model image. Being the manufacturer and also the export level wholesaler we know very well that now everyone is aware of the market prices of velvet dresses so by knowing the online market area we have estimated and introduces the attractive pricing. 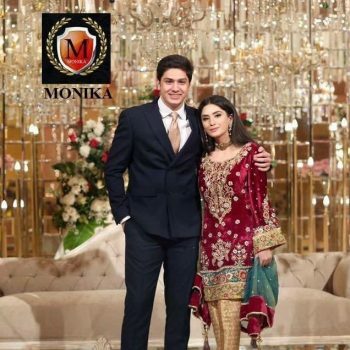 Faisalabad Fabric Store is one of the leading stores where you can get stitch designer suits replicas and also original designer suits within a low price range. By owing our own stitching units we also providing the huge discount on stitching rates and you can also get the quality stitching. We are using the latest Jockey machines in our unit to stitch the quality fabric suits. Apart from readymade velvet dresses you also have the choice to customize the beautiful and embroidered suits by your own style and size. Our standards of stitching are very strong; the whole talented team is hired to give you guys amazing quality part wear to make your day memorable. If we talk about the color combinations of velvet Pakistani designer suits and kurtas we have mostly demanded of Blue salwar kameez velvet, black and Navy blue the most demanded velvet dresses, dark Green color embroidered velvet dress is very popular in girls plus the Maroon and Red color velvet stitched salwar kameez style velvet party wear is also available in cheap rates. We have some handsome companies to deliver your package safely at your doorstep either you are in Pakistan or from out in foreign. Having the magnificent dealing with the great Pakistani shipping agencies we have the best and wholesale pricing of shipping to all over the world. 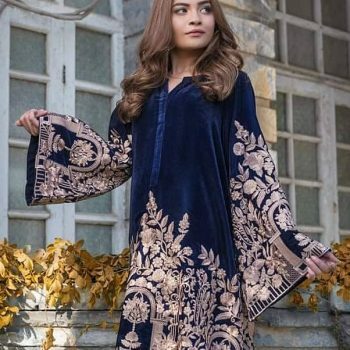 If you are from USA or UK and wants to Buy the massive collection in designer replica velvet dresses, we have the great channel to send out Pakistani embroidered latest velvet collection in the protected and simple way. You can discover us on Facebook Page, Pinterest, Youtube channel, Email: saadlovly@gmail.com or WhatsApp: +92 332 6892363 with Mr. Ejaz Ahmed.